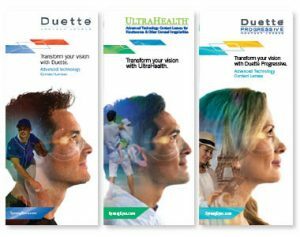 Transform your astigmatic patients’ vision. Scleral lens based on Ocular Anatomy Toric Peripheries with Linear Landing Zones. Corneal GP lenses offer Tear Reservoir with Linear Landing Zones. We’ve developed a number of ways to support you in your marketing efforts from eye-catching marketing materials for your practice, Website and social media content, direct marketing emails to patients, videos and more! Ask your SynergEyes Account Manager about customized marketing resources for your practice, or submit a quick request to our marketing team for more information.